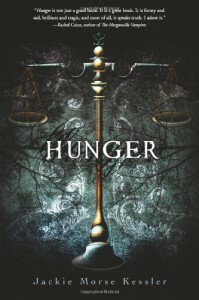 Hunger is an alternative take on a real problem that many of today's teens are struggling with - anorexia. When Lisabeth is given the mantle of one of Horsemen of the Apocalypse, how fitting it is that her title would be Famine. Her struggle to avoid food is pushed to the forefront as she is faced with the reality of starvation all over the world.As I read the book, I impatiently waited for the moment when Lisabeth would take up her position as a dark rider and fly with her horse in the sky. The first one-third of the book dealt with the main character's eating disorder, which might have interested me more if I had picked up a book specifically dealing with eating disorders. Maybe I was in more of an adventurous mood, but I wanted to read about the "horsemen" and Lisabeth's encounters with War, Death and Pestilence.However, the first portion of the book was necessary to tell Lisa's story. It was crucial to understand where the character's mind was at in order to see where she was going.Without giving in to using spoilers, the end left me scratching my head a bit, but it also left me wanting more insight into the world of the riders. Bring on Death!